The objective of this tutorial is to build a simple autocomplete feature based on data extracted from wikipedia (see on-line demo). Because is not always easy to understand the power of SPARQL and of Semantic Web technologies in day-by-day programming, We provided a simple example that solves a very general and frequent problem: autocomplete an input field selecting data from a large dataset. Suppose that you want to write an autocomplete script to help a user writing the name of a river in a form. Suppose that you want that available in multiple languages. You would face a key and time consuming problem: populating and maintaining the big dataset needed to drive the script. Here is where the Semantic Web does the magic: you can use Dbpedia to access the full "Wisdom of the crowd" contained in Wikipedia as linked data and get a list of all rivers, in any language! Dbpedia is a great public service but unfortunately it does not ensure any SLA. Sometime the service is down for maintenance and you can't predict when that would happen. That is not acceptable if you need to create a solid and reliable application. A reasonable solution is to copy the data you need from dbpedia to your own knowledge base system, so you can safely use it in your application. This is where the LinkedData.Center service plays its role. 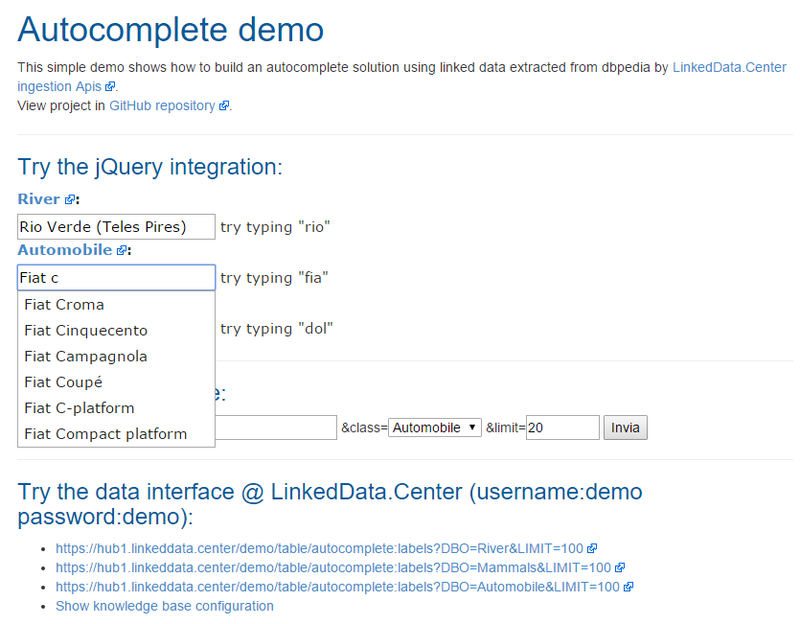 LinkedData.Center allows you to quickly create and host your knowledge base populated from any linked open data sources both private and/or public. To use the created knowledge base, LinkedData.Center exposes a dedicated and password protected sparql end-point, fully compliant with the last W3C semantic web standards. You can create data mashup, apply rules, data inferences and many other features. Last but not least LinkedData.Center keeps your knowledge base aligned with the used data sources re-indexing them automatically and only when needed. The script, by default, connects to https://hub1.linkeddata.center/demo/sparql endpoint. You can also use your own LinkedData.Center instance (free tiers available) just changing credentials in the api code. The knowledge base is populated starting from a Knowledge Exchange Engine Schema (KEES) file. This file is the core of the project. install vagrant and virtual box on your workstation. open a shell and type the command vagrant up. A new virtual machine with all needed tools will be ready and running in few minutes. point your browser to http://localhosts:8080/demo . Publish the project in a web server that supports php 5 (with curl extension). The provision script contained in the Vagrant file will give an idea of a complete api installation on a ubuntu 14.04 box. term: filter for auto completion. Search is enabled if you provide at least two characters. list: maximum number of items returned. Default 10, max 100, min 1.
lang: preferred language using the two characters international coding standard. Default is en (means english). class: the name of the dbpedia classification. This example supports Automobile (default), River and Mammal. Try Yourself in the demo site. create your domain specific api to allow your application to access data. To improve performances you can add cache at server side script. Autocomplete project is licensed under the MIT LICENSE .